In the past few years, Nihad Awad, head of the Council on American Islamic Relations (CAIR) and other top CAIR leaders have been feted to a dizzying array of non-Muslim defenders in the media, Congress, local law enforcement like Los Angeles County Sheriff Lee Baca (who recently asserted that any attack on CAIR is an attack on all Muslims). Never mind that CAIR was created in 1994 as a Hamas front group but no one paid any attention as CAIR successfully portrayed itself as a "civil rights" group, ready to issue diatribes and calls of racism to anyone who questioned CAIR's ulterior agenda and modus operandi. Literally scores of Congressmen, mayors, governors and law enforcement commanders cozied up to CAIR as the new oppressed ethnic minority on the block. This past week, nearly the entire Chicago congressional delegation pledged their support to CAIR. Even the NYPD pulled from its anti-terrorism curricula, at the behest of CAIR, the acclaimed documentary called the "Third Jihad" as too conspiratorial and racist in its depictions of radical Islamic fanatics bent on carrying out acts of terrorism. CAIR's real agenda, already in effect in the Obama Administration, is to sanitize and censor from the American political and governmental vernacular any reference to "radical Islam" under the claim that such a term was racist and that by excising the reference to radical Islam this would ultimately persuade Americans that such a term was fabricated by the "enemies of Islam." Unfortunately for CAIR, the majority of terrorist plots since 9-11 were carried out by radical Muslims. Still, CAIR, while portraying itself as a peace loving civil rights group, would unceasingly label any critic of CAIR or of radical Islam as a racist for daring to reveal CAIR's true agenda. And over time, the New York Times, Washington Post, LA Times, Associated Press, MSNBC and CNN would abet the legitimacy of CAIR by describing it repeatedly as a civil rights group (akin to the mainstream media describing and interviewing former KKK leader David Duke as a "peacemaker"). This also scandalously joins in CAIR's campaign of calling critics of CAIR or radical Islam "Islamaphobes and racists." So the modus operandi of CAIR would be to go on the offensive, aided by the mainstream media, after any official, author or organization that had the audacity to suggest an ulterior illicit agenda of being non patriotic or of harboring a covert radical Islamic agenda to infiltrate this country from within, as was revealed unambiguously in the FBI's sudden 2005 discovery of hundreds of thousands of secret internal Muslim Brotherhood (MB) documents that revealed secret plans for a "civilizational jihad" that would secretly infiltrate American society from within. According to federal prosecutor Nathan Garret, these documents were the most important national security findings in 50 years. But in what has become a corrupt practice of the mainstream media, most newspapers ignored or paid scant attention to these astounding documents, following the dictates of CAIR or of the Islamist ideologies of the reporters themselves which they had grown to develop. In the meantime, the gentle sounding Nihad Awad would publicly outreach to Jewish and Christian groups in creating an aura of tolerance. So imagine my shock when I read Awad's comments he delivered in 2010 before a joint convention of the Muslim American Society (MAS) — another front for the Muslim Brotherhood whose leaders had called for jihad in Palestine to kill all the Jews—and the Islamic Circle of North America (ICNA), a Jam'at group from southeast Asia that had on its website hadiths to kill all Jews. Both MAS and ICNA have dozens of chapters throughout the US. He cited as inflammatory comments from a congressional member that "there are too many mosques in this country," a former House speaker saying the United States is experiencing an "Islamic cultural-political offensive designed to undermine and destroy our civilization" and a religious leader who called Islam "wicked" and "evil." "Did Israel freeze any settlements? They did not. Not only that, to bring Israel to the table negotiations to talk about more fair solution to the conflict, the United States government begged Israel to stop building settlements. Israel did not. The United States bribed Israel. They gave them billions of dollars and promised to give them arms just to freeze the settlement buildings for 90 days. They came, Israeli delegations came here and they put so many conditions. " The reality of those negotiations was that Israel had no preconditions with the settlements and rejected the US proposal as being unworkable, yet Awad postured it was the Israelis who "held out" for more US "bribe" money. "They exploited the American generosity with all sorts of (UI word) and other things. I will explain. What's the end result? Nothing. Israel's still position is the same. What's the impact of this stiffness towards the President of the United States and the office of the presidency in the United States? It's really the erosion of the image of this country around the world. Nobody even thinks the administration is interested in talking about the peace process now because of Israel's behavior." Contrary to Awad's efforts to blame Israel for the breakdown in the talks, it was the Palestinian Authority's (PA) refusal to negotiate with Israel (and the refusal of the Palestinians to drop the "right of return"— a policy that meant suicide for Israel) that halted negotiations. Something Awad failed to address. "So we in the activist community, yourselves, we always call on the President, on the White House to do things. But there's nothing being done. Why? Because the second power lies with the Congress. Members of Congress compete with each other, whether Democrats or Republicans, to please the Israel lobby, to please Israel. Some of members of Congress are willing to put the interests of Israel ahead of the United States' interests." "Why? Because we have to understand what drives members of Congress. Is it values, principles or votes and money and pressure? The pro-Israel lobby has mastered deception, pressure tactics and exploiting the system of giving money to candidates and putting pressure and threatening some candidates with either scandals or what have you. And they managed over many years to have this huge influence on not only members of Congress but those who want to be elected officials in the United States." Attributing masters of deception to the "pro-Israel lobby" by Awad is a thinly disguised euphemism for Jews. Awad's claim that pro-Israel members of Congress traitorously put Israeli interests ahead of US interests is a blatant age old anti-Semitic variation taken from the notorious anti-Semitic Protocols of the Elders of Zion. Awad's allegations are the same only slightly cryptic posturing about Jews used by the KKK and other racist white supremacist organizations. The reality is that most Congressmen, like the 63% of Americans who support Israel, do so out of ideological sympathy and convergence of interests. "We cannot change the U.S. foreign policy towards Palestine from the top. It has to start at the bottom. We have to educate others. Before we educate others, we have to educate ourselves. Many of us, those who are Palestinians or Muslims or non-Muslims who believe in justice for the Palestinians they think because they know it is a just cause, they think that this is enough to talk about the issue of Palestine. This is wrong." "We need to educate ourselves about specifics of this country and how this issue is hurting our government. It's hurting our economy. It's hurting our status in the world. It's hurting our claim to be a just society, liberal society, progressive society that goes to the aid of the weak and the oppressed, when we in fact do everything to the opposite when it comes to the Palestinians." "We need to understand the [microphone noise over word] of how this [microphone noise over word] has been misfed and influenced and has been given the wrong information about the Palestinian side." For decades, supporters and apologists of Palestinian terrorist organizations such as Hamas and the Palestinian Islamic Jihad (PIJ), including organizations such as CAIR, have blamed Israel and American support for Israel for the "plight"and oppression of Palestinians, justifying the terror committed by those Palestinians against Israel. That terror, itself, is always minimized and justified as "resistance." Thousands of explosive rockets fired by Hamas and other armed terror groups from Gaza into Israeli civilian residential areas is "resistance." Suicide bombers on buses and in shopping malls are "resistance" attacks. When Israel responds with defensive measures, it is oppression and occupation. This is yet another example of anti-Israel and anti-American propaganda. "Now for the past so many years people spent a lot of time calling the White House and calling Congress and they asked the President to say something, to do something about the bombings of Gaza, the building of settlements, the demolition of homes, the uprooting of olive trees, the deportation of Palestinians and the targeted killings of innocents and the destruction of the Palestinian economy, all of these things. People were told they were right, and they spent a lot of their energy. And what's the result? Nothing." In fact, what Awad, as a good propagandist left out, were the facts that Israel had ceased the demolitions of terrorist homes and stopped targeted assassinations for many years, that the Palestinian economies in both the West Bank and Gaza were flourishing and that Palestinians were no longer being deported. "There has been a shift in the last year, big shift. The military for the first time, and the military has huge credibility in Washington, D.C., when the Department of Defense comes for any budget request, hardly any member of Congress will say no, because this is for national security, for the first time in the history of the U.S./Israeli relationship, the commanders, the military leaders of the United States, have said that Israel is hurting the United States. And this is [applause over few words] that what goes on in Iraq, the intensity of the fighting in many places, they blame Israel for it, that Israel is instigating this anti-American sentiment because of what Israel does. Israel is putting America in jeopardy. And when the military, the U.S. military says so, people should listen. And now I believe there's a growing movement with the Congress and in the public to distinguish between America's interest and Israel's interest." Last year, General David Petraeus did publicly state the Israeli – Palestinian conflict had an adverse effect on US peacemaking in the region, but he and no other US military commander blamed Israel or the US/Israeli relationship for this. In fact, General Petraeus and other senior US military leaders have reinforced the solid defense and security relationship the US shares with Israel. Awad's contention is simply another example of his anti-Israel and even anti-American provocation. Further, how does Awad's position in this square with his contention that a pro-Israeli Jewish cabal controls Congress and the US Administration? If that were so, the military command would follow lock-step with the supposed directives of the puppet masters. The reality is, there are no such puppet masters. "But you need to do the following: I would recommend to you to read the following books. Number one - The Israel Lobby by a person John Mearsheimer. He and Professor Stephen Walt, they wrote a strategic paper and book. It's called The Israel Lobby. In that they show that Israel is not as pro-Israel, supporters claim that it is a strategic ally of the United States and that's why the United States has to be on the side of Israel all the time no matter what Israel does. This book is an objective research, first class scholars in political science from the University of Chicago and University of Harvard [sic]. They both prove without any shred of doubt that Israel has been a strategic liability on the United States. And it uses facts. This book uses facts. And they have evidence to show that." The Israel Lobby book was such a classic case of anti-Semitic conspiracies that it included the Washington Post and NY Times, hardly friendly to Israel, as part of this Jewish cabal. And, if the "lobby" was so powerful, how did these authors get this book published by Jewish book publishers? "Another magazine we should subscribe to is The Washington Report on Middle East Affairs. Google it. Subscribe to it. It is written and prepared by mainly former U.S. officials in the Muslim world, in the Middle East. And they love their country. They love the interests of the United States. But also they give you a clear and good analysis of the views and issues and Congress and who's doing what. But also, the most beautiful thing about this magazine is they publish a list of how much the Israel lobby on regular basis gives them contribution to members of Congress and those who run for public office in the United States. Those who like math, those who know how figures work in Washington, D.C., they will know that there is science behind the influence of the pro-Israel lobby, on members of Congress." WREMA has been described by the Anti-Defamation League (ADL) and other mainstream Jewish civil rights groups as blatantly anti-Semitic. Having read about 150 of their issues over the past 15 years, nearly every article blames Israel and the "Jewish lobby" for all transgressions committed by radical Muslim states. WREMA's conspiracies about the Jewish lobby fits well into the Protocols of the Elders of Zion fabrication. "Then, work with candidates for public office, not only members of Congress or the Senate, even at the city council level and at the district level. That's where a lot of investment, the pro-Israel lobby is putting. They take these people to tours to Palestine. They show them the settlements, but they don't show them the refugee camps. They take them to Tel Aviv, but they don't show them Gaza and what Israel has done to Gaza. They don't show them the destruction that Israel has done to the Palestinian life and infrastructure and future…. They take them and they brainwash them. And also they promise them with funds and with votes." Even Judge Goldstone has recanted his allegations against Israel. Moreover, it's Hamas which launched thousands of rockets and terrorist attacks from Gaza that precipitated Israeli retaliation, a fact Awad ignores. And why should Israel show visiting officials Gaza? Israel left Gaza and ceded control to the Palestinians. Awad claims Israelis "brainwash" these officials, as though such officials have no ability to render their own judgment and decision-making. Recently, we saw a report about highly developed parts of Gaza and the West Bank showing how economic development and modernization (hotels, restaurants, shops, well stocked food markets, modern malls) are taking root among significant portions of the Palestinian population, yet this is significantly under-reported because it does not fit the "Israel is the oppressive occupier" theme. Why doesn't Awad and CAIR ever tout these advances of the Palestinians? 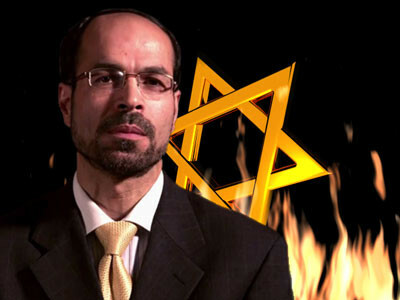 In his speech, Awad demonstrated his true background as an anti-Semitic, Israel-hating provocateur who uses his position in CAIR to further a radical Islamist agenda, and that is precisely the reason CAIR exists.